Judge Dana Christensen is scheduled to hear arguments in six consolidated lawsuits in the federal district court in Missoula, Montana on Thursday. The “comprehensive hearing” could halt Wyoming’s hunt that’s scheduled to begin on Saturday, one of the plaintiffs, Robert Aland, said in an email. “I understand that a packed courtroom is expected…” wrote Aland, a grizzly activist, attorney and resident of Chicago and Jackson Hole. As Aland, numerous environmental groups, the U.S. Fish and Wildlife Service, state of Wyoming and hunting groups girded for the hearing, prospective hunters were learning the grizzly bear basics. One of those students was Tom Mangelsen, a renowned Jackson-based wildlife photographer and activist who applied for and won a lottery draw for one of 22 potential licenses. A former hunter who “got an A+ in marksmanship,” Mangelsen said the course taught about the differences between black and grizzly bears, “also where the vital organs are to make an ethical kill.” He is old enough that he is not required to take a firearms safety course and there’s no certification required to determine if his shooting skills are still up to par. He paid $602 for his chance to hunt a grizzly. Mangelsen has his gear ready — a Nikon D5 camera with an 80-400 zoom lens. He might ready his 600 millimeter lens as well. Mangelsen plans to “shoot ’em with a camera.” If the hunt begins and the handful of hunters in line before him either kill bears or see their 10-day licenses expire, Mangelsen’s permit would become active. His active license would preclude another hunter from going into the zones where Mangelsen would be allowed to hunt during Mangelsen’s 10-day window. The two-hour class reinforced his aversion to trophy hunting, Mangelsen said in an interview. Hunters are not required to retrieve and eat the meat of a grizzly bear because Wyoming classifies the species, along with wolves and cougars, as trophy game, not big game. Bear 399 is the world-famous grizzly sow that’s birthed 17 cubs, Mangelsen said. 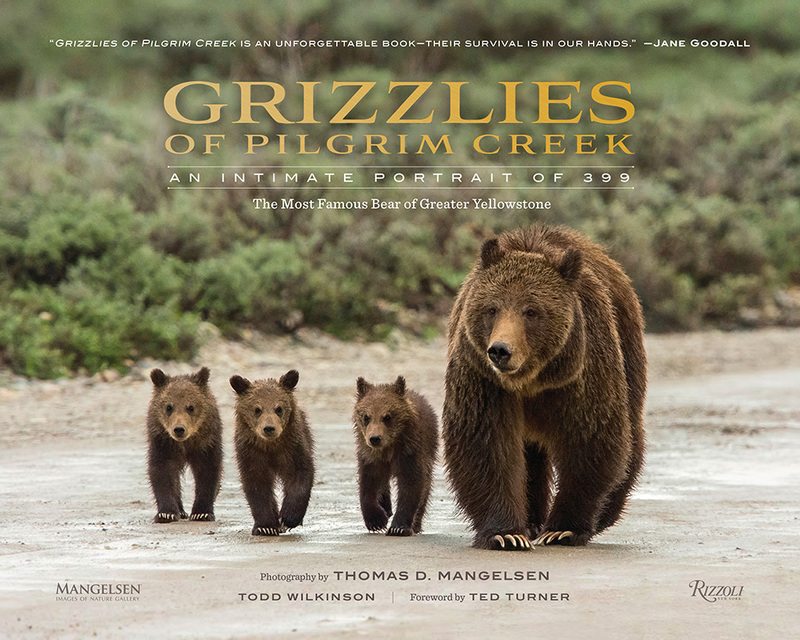 She is on the cover of his book “Grizzlies of Pilgrim Creek,” with three cubs. She frequents Grand Teton National Park but wanders beyond its borders, perhaps even beyond a no-hunting buffer zone Wyoming Game and Fish Commission set to help protect what Mangelsen calls “rockstar” grizzlies. “Shooting sentient animal with emotions and intelligence for fun is barbaric,” Mangelsen said. Others have raised the issue with Wyoming’s chief game warden Brian Nesvik, Nesvik said in an interview. “I’ve heard from folks that are ethically concerned by that and bothered by that,” Nesvik said of the trophy game designation. The trophy issue is one of ethics and values — public policy but not biology — he said. As such, decisions about a species’ trophy or game status are made by Wyoming lawmakers. 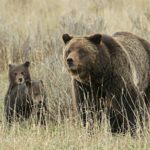 In a statement regarding the removal of the grizzly bear from the federal threatened species list last year, the organization said it would work with other conservation leaders to support “ethical, scientifically regulated hunting,” once bears no longer had federal protection, according to OutDoors Unlimited Magazine. Cooking grizzlies — or not cooking them — might make for campfire debate, but the issue of trophy game versus big game designations isn’t likely to come before the court on Thursday, said Andrea Santarsiere, senior attorney for the Center for Biological Diversity. Thursday’s hearing consolidates six cases, Santarsiere said, including actions brought by the Crow, Northern Cheyenne, and other Indian Tribes that claim the federal government failed to consult with them regarding the delisting. Other involved parties include Santarsiere’s group, the National Parks Conservation Association, Sierra Club, Western Environmental Law Center, WildEarth Guardians, Western Watersheds Project, the Humane Society of the United States and others. Safari Club International, the National Rifle Association, the Rocky Mountain Elk Foundation, Sportsmen’s Alliance Foundation and the states of Montana, Idaho and Wyoming filed papers to support the federal government in its defense. The suit centers on three points, starting with the contention that grizzlies are in decline due to climate change and other factors. 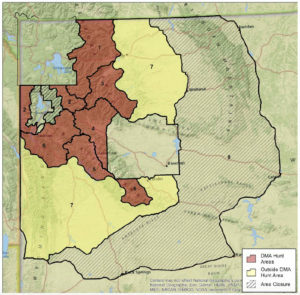 The Center also argues that the federal government has not considered the impact delisting one portion of the grizzly population — the Yellowstone Ecosystem portion — will have on other existing or potential grizzly colonies. Finally, a conservation strategy or management plan, the linchpin of the bear’s future, was radically changed without adequate public comment, Santarsiere said. Game and Fish’s Nesvik said he believes it is time for Wyoming to finally have authority over grizzlies, 43 years after the federal government stepped in and protected them under the Endangered Species Act. But also among prospective hunters “there’s certainly a lot of excitement,” he said. “They have been extremely engaged with the department, trying to learn about grizzly bear biology and distribution, abundance, those kinds of things. We’ve had a good experience with the hunters on the [license] list. Wyoming seeks to help maintain a population of 674 grizzlies in the Demographic Monitoring Area, a 19,270-square-mile census area surrounding Yellowstone and Grand Teton national parks. In 2017, bear managers estimated 718 grizzlies in the DMA. Wyoming’s proposed season could see as many as a dozen bears shot dead outside the DMA — where grizzlies are not counted toward the population goal — and another 10 inside the census area. Wyoming’s hunt, should it take place, begins Sept. 1 in hunt area 7, fringe country around the demographic monitoring area where Wyoming believes bears are socially unacceptable and where their presence should be discouraged. Hunting inside the DMA, the area where the critical annual census takes place to ensure the population endures, would begin in the middle of September. A smaller area inside the DMA is called the Primary Conservation Area or the Recovery Zone. It includes all of Yellowstone National Park, the northern part of Grand Teton National Park and surrounding land that’s mostly national forest. 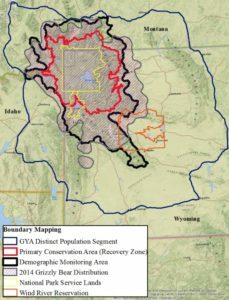 The primary conservation area covers about 9,208 square miles and hunting would be allowed there, except in the parks, in the John D. Rockefeller Jr. Memorial Parkway and in the buffer zone outside Grand Teton. Dan Wenk, the outgoing superintendent of Yellowstone National Park who has sought to protect Yellowstone grizzlies for the benefit of touristsamong other reasons, disagrees with that strategy. He believes grizzly bears should not be hunted in the primary conservation area, he said in a telephone press conference early this month. Photographer Mangelsen would rather no hunting be allowed anywhere. He said his hunter orientation provided a lot of information, perhaps too much for a person to absorb. He’s doubtful hunters will be able to distinguish between sexes beyond 25 yards or so. He doesn’t think some legal weapons — pistols and bows, for example — are appropriate. “All those weapons except a high-powered rifle are really inadequate to efficiently and ethically kill a bear quickly,” he said. The larger scale hunting of female grizzlies outside the DMA — up to a dozen could be killed — would harm the ecosystem population, Mangelsen said. “We’re going backwards,” he said of the Wyoming hunting plan.